1. In 2010, 1.5 million women around the world had breast augmentation surgery. About 300,000 of them lived in the United States, according to the International Society of Aesthetic Plastic Surgery. 2. Breast implants are measured in cubic centimeters (ccs) rather than cup size. On a woman who is completely flat-chested and has a medium-sized frame, a 450 cc implant would be equivalent to the average C-cup bra. 3. The largest standard saline implant is 775 ccs, while a silicone gel implant is 800 ccs. 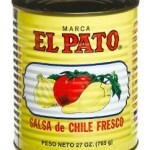 That’s equivalent to about 27 ounces, like this can of salsa. 4. The difference between a 375 cc and a 400 cc implant is less than 2 tablespoons – the amount of oil you would add to boxed pancake mix. 5. Outside of the body, a saline implant would freeze at about 28 degrees Fahrenheit, while a silicone gel implant would ice up at around 170 degrees below zero. Because your breast implants are close to your body, your natural body heat will keep them warm. 6. An implant’s silicone shell would melt at temperatures greater than 392 degrees Fahrenheit. A conventional sauna is typically between 150 and 190 degrees. If you were in an environment where your implants would melt, you’d melt, too. 8. Breast implants are designed to be sturdy, and each manufacturer has its own testing protocol. Allergan tests its implants by exerting nearly 55 pounds of force on them repeatedly, up to 6.5 million times. By contrast, a routine mammogram exerts about 40 pounds of force when it compresses the breast, and if a woman had 50 mammograms in her lifetime, it would be a lot. 9. 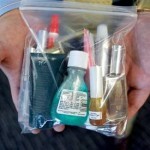 The TSA says that liquids and gels are safe to bring aboard an aircraft in limited amounts – 3.4 ounces or less. Thank goodness breast implants are “packed in your luggage,” so to speak, because one 425 cc implant is equal to about 14 ounces. It would be hard to squeeze it into one of those quart-sized plastic bags. 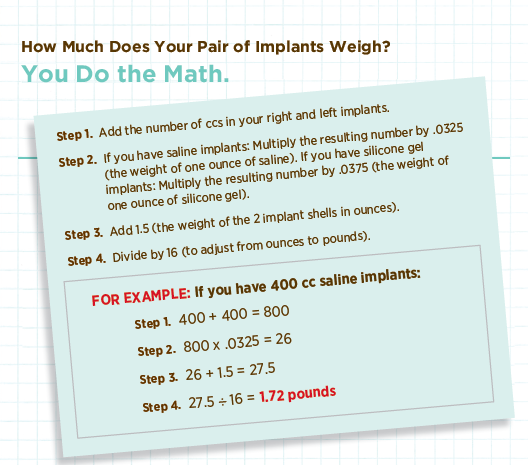 To figure out how many ounces your implants are, divide the number of cubic centimeters in each of them by 30. 10. It’s rare for surgeons to charge more for a breast augmentation with larger-sized implants. Manufacturers don’t charge by the cubic centimeter either: They charge one set price for all off-the-shelf saline breast implants, whether they are 200 ccs or 600 ccs, and another set price (about $1,000 higher) for silicone gel implants.